Mauna Lani Resort, North Course Hole 2: This golf hole heads towards, and gets quite close, to the ocean. Is is a fairly straight and wide par five and yields a decent chance to score well. 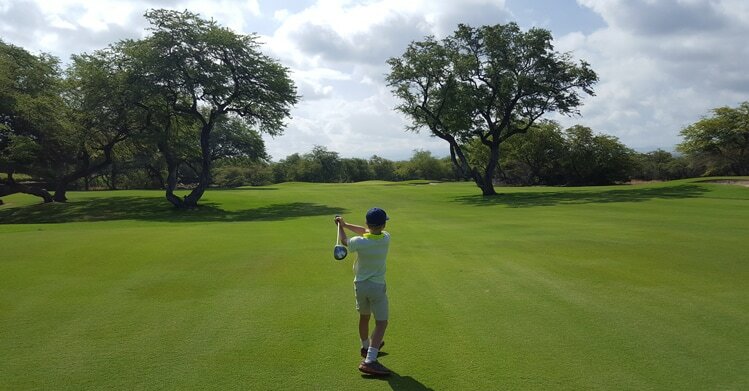 Mauna Lani Resort, North Course Hole 3: This fairly long par four is a dogleg left and has a pretty tight drive between the trees. The approach also has to find a way over or between two large trees that guard the fairway about 100 yards out from the green. 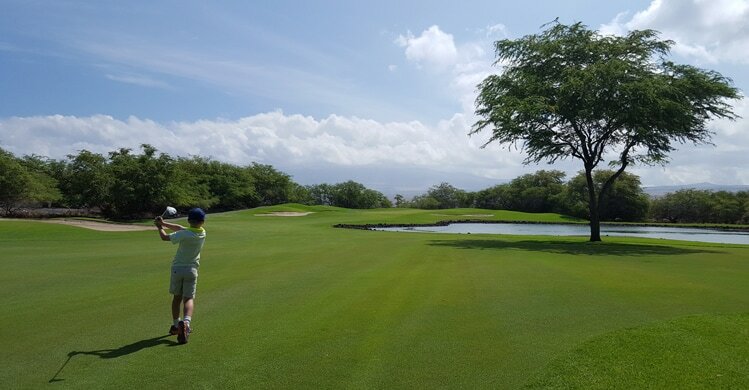 Mauna Lani Resort, North Course Hole 4: This par four has one of the more daunting drives on the course, as it requires a pretty decent carry and the landing area is not particularly wide. The approach is uphill over a massive bunker to a pretty shallow and wide green. Mauna Lani Resort, North Course Hole 5: This downhill par three has a lava-ringed lake that is short and right of the green. The putting surface is large, but the front-left bunker cuts into the surface making front pin placements especially perilous, even if shorter. 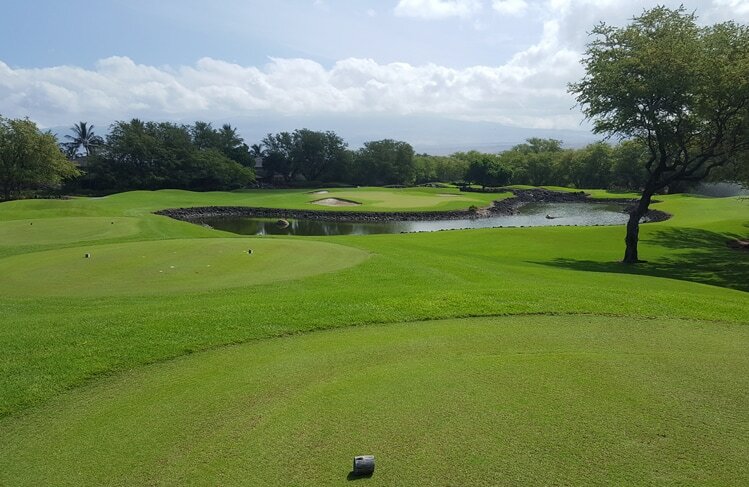 Mauna Lani Resort, North Course Hole 6: This strong par four has water than is in play for a big drive hit to the right. The green is set a little bit away from the water so only a mishit will find it on the approach. However, the bunker to the right makes any pin placement over that very tough..
Mauna Lani Resort, North Course Hole 7: This par five has an undulating fairway and lava on both sides. The approach is most interesting, though, as the green is set left over a final area of lava. 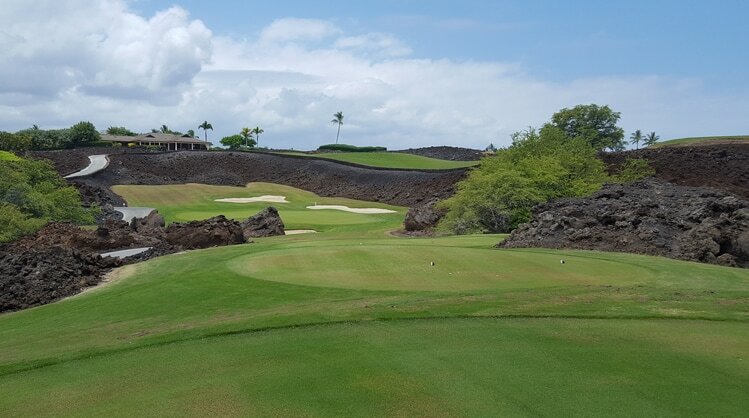 Mauna Lani Resort, North Course Hole 8: A tough par three, this one is long and has a bunker to the left and a drop-off to the right that yields tough up and downs from most directions. 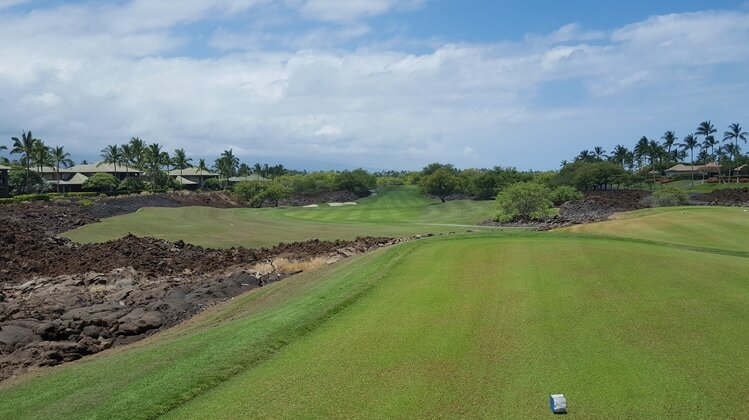 Mauna Lani Resort, North Course Hole 9: This is a very long par four to finish the front. It has a wide fairway so the player can give it a blast. The ocean back drop is nice but the lake to the right of the green should be the focus as it must be avoided, along with the fronting bunkers. 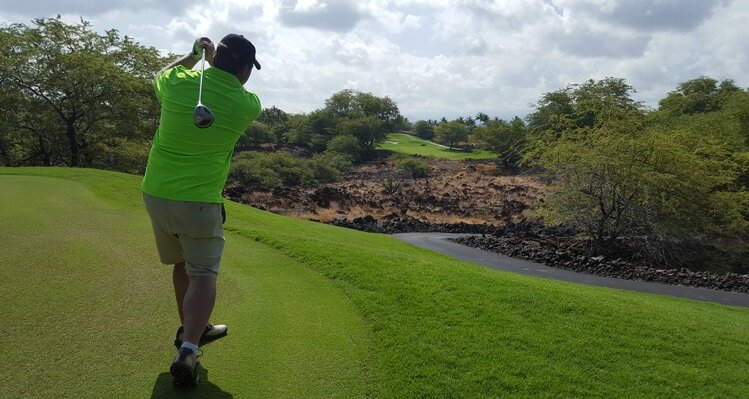 Mauna Lani Resort, North Course Hole 10: This par five has one of the most spectacular tee boxes anywhere with the ocean behind, lake in front, and the fairway stretching out before them between lava fields on both sides. The tee shot is tough but from there, the hole is pretty straight between the trees with the front-right pot bunker being the "must avoid" for a good score. 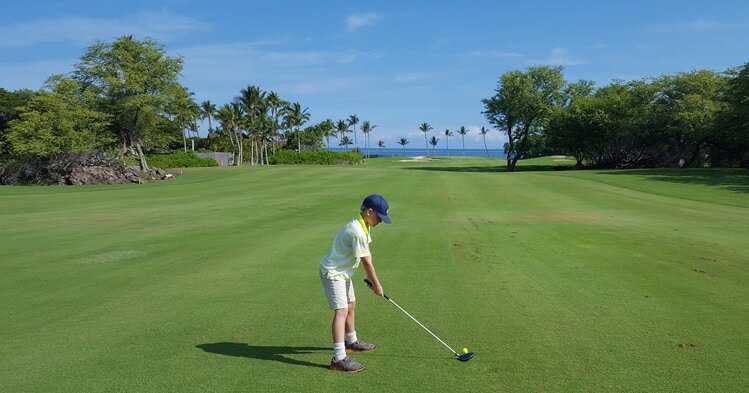 Mauna Lani Resort, North Course Hole 12: This medium length par four is no bargain and the fairway really must be hit; the second shot is way uphill to an undulating green that is tough to hit and putt. 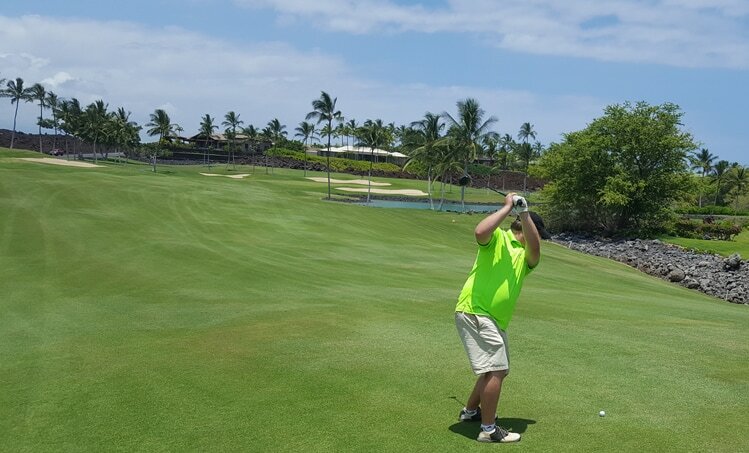 Mauna Lani Resort, North Course Hole 15: This par five is a 90 degree dogleg right. The tee shot can go straight out or try to cut the corner (and OB) to shorten the approach. The green is very wide and has plenty of bunkers beyond the lake to the right to cause trouble. 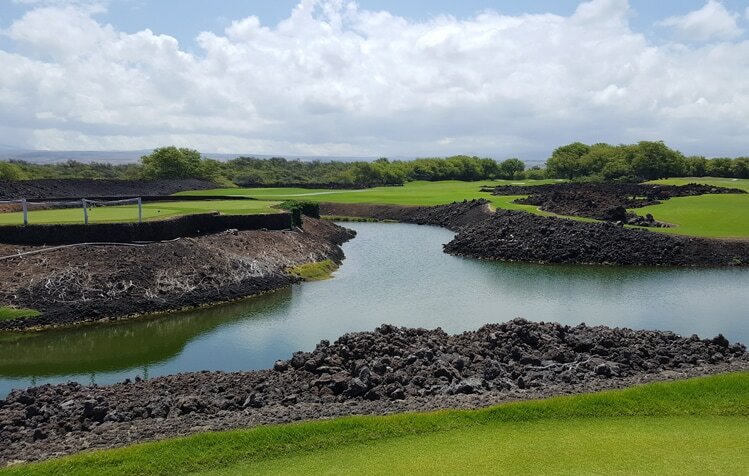 Mauna Lani Resort, North Course Hole 17: The signature hole is set in a lava bowl that feels man-made, but is not. The shot itself is not hard, but the hole is quite a unique experience.